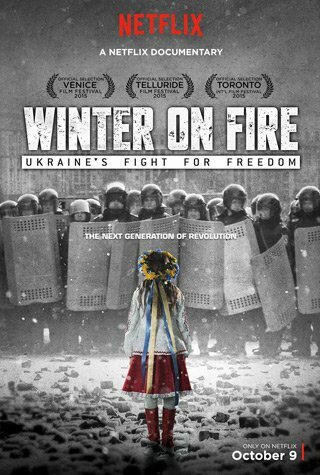 Chronicling events that unfolded over 93 days in 2013 and 2014, Winter on Fire witnesses the formation of a new civil rights movement in Ukraine. What started as peaceful student demonstrations supporting European integration morphed into a full-fledged violent revolution calling for the resignation of the nation’s president. The film captures the remarkable mobilization of nearly a million citizens from across the country protesting the corrupt political regime that utilized extreme force against its own people to suppress their demands and freedom of expression. The Winter on Fire filmmakers investigated the escalating political crisis in Ukraine from directly within the conflict zone. At the onset of demonstrations, they were there to record the special forces who were deployed to disperse the crowds, beating and seriously injuring hundreds of protesters. It was this moment that ultimately gave rise to mass protests and large-scale civil unrest in the country. In response, millions of Ukrainians rallied together to fight against the police state. Through interviews with protesters, activists, journalists, medical workers, artists and clergy representing multiple generations, social classes, nationalities and faiths, including a twelve-year old activist, the film tells the story of a diverse movement that self-organized towards one common goal, that stood their ground in the midst of extreme bloodshed, despair and the harshest of conditions.